In 2017, Forbes Magazine ranked the University of Georgia as one of the top 25 universities that excel both academically and in sports. The women’s indoor track & field and men’s outdoor track & field teams led the way by capturing national championships. Also scoring in the top 10 were football (2nd), women’s outdoor track & field (2nd), men’s indoor track & field (3rd), women’s tennis (5th), gymnastics (7th), softball (7th) and men’s swimming & diving (10th). Additional teams adding points included women’s swimming & diving (11th), baseball (17th), women’s basketball (17th), women’s cross country (17th), men’s tennis (33rd), women’s golf (30th) and men’s golf (62nd). The National Association of Collegiate Directors of Athletics (NACDA) and USA Today began the Directors’ Cup competition during the 1993-94 academic year. Points are awarded based on each institution’s finish in up to 20 sports in Division I – 10 men’s and 10 women’s. UGA’s highest finish was No. 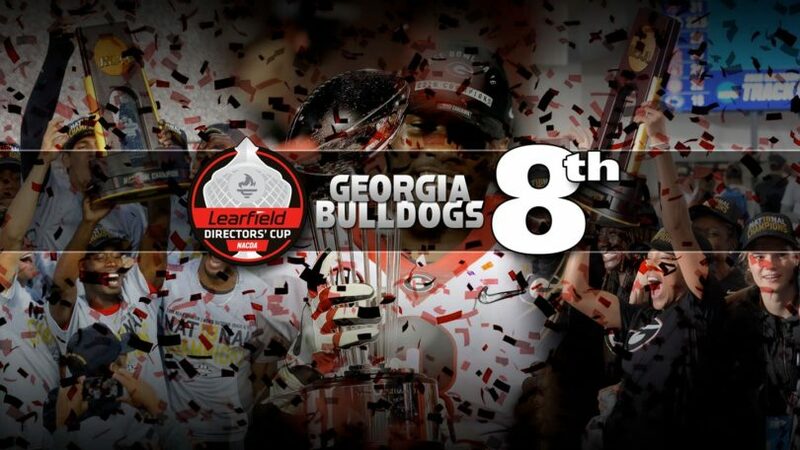 2 in 1998-99, one of 10 top-10 rankings for the Bulldogs. Within the SEC, Georgia is one of five schools with double-digit top-20 NACDA finishes over the past 21 years, joined by Florida (21), LSU (16), Texas A&M (13) and Tennessee (10).